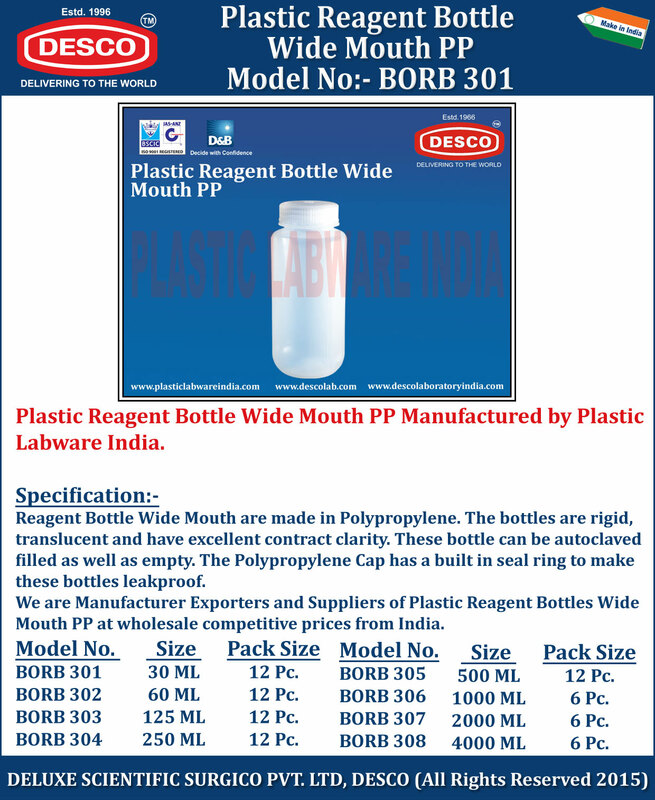 Reagent Bottle Wide Mouth are made in Polypropylene. The bottles are rigid, translucent and have excellent contract clarity. These bottle can be autoclaved filled as well as empty. The Polypropylene Cap has a built in seal ring to make these bottles leakproof. We are Manufacturer Exporters and Suppliers of Plastic Reagent Bottles Wide Mouth PP at wholesale competitive prices from India. BORB 301 30 ML 12 Pc. BORB 302 60 ML 12 Pc. BORB 303 125 ML 12 Pc. BORB 304 250 ML 12 Pc. BORB 305 500 ML 12 Pc. BORB 306 1000 ML 6 Pc. BORB 307 2000 ML 6 Pc. BORB 308 4000 ML 6 Pc.